So another gift-worthy equestrian-labelled wine is the Washington state wine 14 Hands. I have tasted this wine, and loved it, but I'm easy. More significantly, I think it has a reputation among wine lovers as being a good wine. f you can't get the wine itself shipped to your state, there is a great wine carrier and also a poster. I love this wine! I actually have an empty bottle of it as a decoration in my kitchen!! I made a browband based on this bottle label last July! It is in my browband album on Facebook. 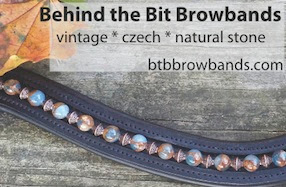 You can see it at www.facebook.com/wovenbeadsbrowbands.